Malden (population 350) sits quietly in a country setting appproximately 6 miles northeast of Princeton in the east-central portion of Bureau County. County Road 1900 Avenue N and County Road 2550 Street E are the main roadways that take you to and from Malden. Both roads connect to U.S. Route 34 located just 1.5 miles to the west. The Burlington Northern & Santa Fe Railroad passes through town as well. The railroad was instrumental part of the town's early growth. The residents have done an excellent job maintaining the life in their community. The high school was probably established in the late 1800s, however an exact date is still being sought. The high school was quite successful in Malden until the end of the 1982-83 school year when it was deactivated. The high school students of Malden now attend Princeton High School. 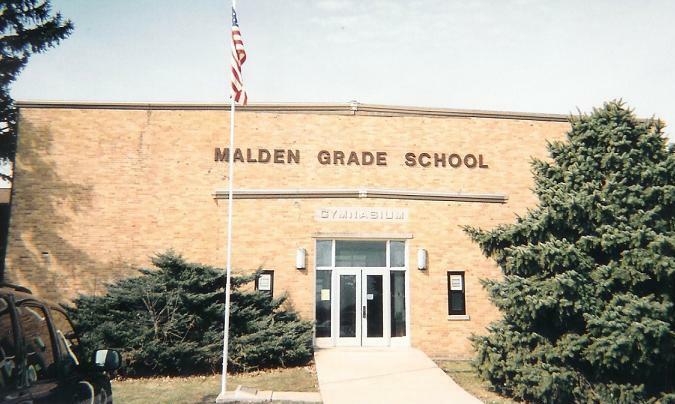 The Malden residents still support their own grade school for grades K - 8. Those students are now educated in the former high school building. School Fight Song: "Onward Malden"
Step up to that line! Scores count up each time! Fight fellows, FIGHT! FIGHT! FIGHT! The Malden Musketeers were a force to be reckoned with in Bureau County during their "hey day". The team competed in the Little 8 conference offering basketball, football, and track for boys. Later the school also offered basketball, volleyball, and track for girls. The school had several great seasons in each sport. The boys brought home a District Championship in basketball. Below are listed the best successes of Malden High School according to the IHSA web site. The post season scores listed below were found on a website titled "Illinois Postseason Basketball Scores". As you can see, the going got rough for many years. However the 1929 District Champs did the hometown folks proud! Though District scores are not available, the Musketeers played Moline HS in the first round of the Sectional before losing by 2 points! The teams of 1969 and 1970 also advanced to the championship game of the District Tourney before losing. finish 3rd in the IHSA Tourney. Lost to Mineral 25-20 in 1st Rd. Lost to LaSalle Peru 48-9 in 2nd Rd. 1935-36 Post season results not available. Sheffield lost in 2nd Rd. 1937-38 Post season results not available. 1939-40 through 1943-44 post season scores not available. Manlius lost in championship game. Tiskilwa lost in championship game. 1946-47 Post season results not available. Manlius lost in title game. 1952-53 through 1957-58 scores not available. Tiskilwa lost in title game. 1963-64 through 1966-67 scores not available. 1972-73 through 1978-79 postseason scores not available. 1978-79 through closing of HS postseason scores not available. Coach Dean Riley started his coaching career at Malden High School in the 1960-61 school year before moving on to Ottawa High School the following year. He would go on to win 300+ games in his career. Coach Lloyd Johnson left Malden to coach at Ohio High School and later Dixon High and Junior High Schools. Malden had one athlete excel in track and field as far as the state meet is concerned. Paul Hensel brought home two medals in consecutive year, including a state championship. He did this before the two class system, which makes his accomplishment brilliant. 1929 Paul Hensel 440 Yard Dash STATE CHAMPION!! The Musketeers had some nice success in boys football as well. Tom Sikorski found the best of the grid iron seasons that the Malden boys enjoyed. Last win in school history 21-6 over Tampico. *John Payne (Class of 1926) - Professor at Columbia University, New York City.